How does it feel to be Ultrarunner of the Year for 2015? 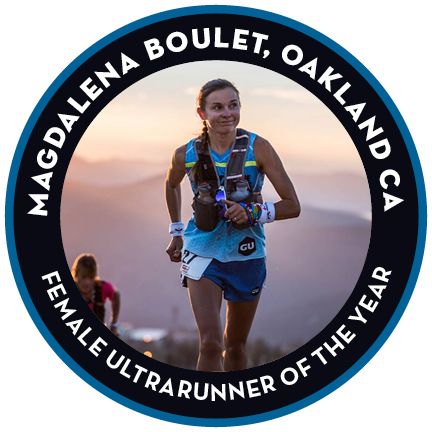 I’m extremely honored to be named Ultrarunner of the Year. I didn’t specifically plan for it, but in the back of my mind, I knew if I ran well in all the races I’d entered for the year that I’d have a decent shot of being considered. But the plan for the year was to take everything one race at a time and learn as much as possible. When you look back on 2015 – what was the most memorable moment for you? What do you consider your best race in 2015? Western States was my best race of the year. It was the one I’d spent the most time dreaming about competing in, and the one I was the most afraid of. I learned so much about myself during my preparation for this race and so much more by racing it. Western States will always have a special place in my heart. How did you feel at the starting line of Western States? What was the key to your win there? First, I am surrounded by an amazing running community where I live and I shared many miles with runners who have a lot more experience in ultra running than I do. I made sure to learn from them during my preparations. My favorite moments include sunrise summits on Mt. Tam with Dylan Bowman, Brett Rivers, Fernando De-Sanamaniego-Steta, Galen Burrell, Topher Gaylord and Matt Laye. And unforgettable Mt. Diablo Summits with Ian Sharman and a weekly Breakfast Club in the east bay with Caitlin Smith & Sam Robinson. Also key for me were the hikes with my son Owen immediately after finishing my long runs. For others doing their first 100 miler – what is your single best advice? Dial in your nutrition strategy during your training. Having a nutrition plan will set you up for success. Because of the hot and humid conditions at Western States I made the decision to run the entire race on GU’s Roctane energy drink, which is a perfect blend of energy and hydration. What was your most challenging race of 2015? Physically CCC was very challenging, mostly because of the very technical course and because it was less than two months after Western States. There’s nothing like it in the US, as far as I know. Not just the elevation profile, but the length of the inclines, the footing, and the altitude are all pretty tough to train for where I live. It opened my eyes to what European style ultrarunning is like. The CCC 100k took me four hours longer than some of my other 100k’s this year. What was the atmosphere like at CCC? The level of competition and the overall atmosphere at the European races I’ve done is amazing. They don’t seem to have the course capacity limits that we do, so they literally have thousands of people running races that in the US would be limited to 400 people. That brings a more electric energy to the event and you want to come back. How is ultrarunning different over there than here in the US? In the US, the vast majority of the entrants of an ultra event have a primary goal of getting to the finish line. For 50 or 100 miles, given my own experience, I think that’s understandable and a worthy goal, there’s nothing wrong with that. But in Europe, it seems that a higher percentage of the participants are actually trying to race, and push themselves to perform better, sometimes at the risk of not finishing the race. What was your deepest low from the year, and how did you overcome it? Dropping out of TNF 50 was tough. This one is my hometown race, so I was looking forward to it all year. I took a bad fall at around mile 20 and by the time I made my way to Stinson Beach my hip flexor was not functioning properly. It was a very difficult decision and I struggled with it for the next 10 miles before pulling out. It’s the first ultra I’ve had to drop out of and it’s just never easy to make this kind of call. What did you learn about yourself in 2015? I learned how important recovery is in ultra endurance events. I learned that you need to give your body and mind a well-deserved break after competing in such demanding events, and that is just not easy for me. My strategy is to practice a multi-dimensional approach to recovery. I need fuel to recover immediately post-race, and I need to take time off from running and engage in activities other than running such as swimming and hiking. I’m learning to meditate to help with rest and relaxation. Why did you get into ultras after such a successful career at shorter distances? I was really ready for a change of pace, both literally and figuratively after 2012. The main reason I did Marathons in the first place was because it’s the longest event in the Olympics. If they had 100k or 100 miles events, I would have started doing this way sooner, because the long trail runs were always my favorite part of training. What were the keys to your successful transition from marathons to ultra marathons? One of the biggest keys to my success is that I just plain love running, especially on beautiful trails for long periods of time. To be good at anything, you need to spend a lot of time doing it. If you love doing it, then spending the time is easy, it is a virtuous cycle. Running long on trails was always a big part of my training, even when I was racing on the track in college. What is the biggest difference between road marathons and ultras? How do you compare and contrast the communities/cultures of road racing and ultras? Nowadays, there are so many people who do both that there isn’t as much of a dividing line between the communities. I’d like to think most road racers and ultra runners both consider themselves part of the same community of runners. Is there a person or people that were influential in getting you into ultras? Watching Rob Krar’s career has inspired me to challenge myself over long distances. His style of racing is very spiritual and deep. I love how connected he is with the discomfort that happens in the late stages of an endurance event. You emigrated from Poland at age 15 – how has that journey influenced your ultrarunning career? I don’t know if being an immigrant has influenced my running career specifically. It does influence my appreciation for what I have and where I live now. I never take anything for granted and make the best of all opportunities that come my way. You are a mom, wife and have a challenging career – how have you been able to balance such a full life with the training and commitment required to be an elite ultra runner? I have some help, and at times I make some sacrifices. GU Energy Labs is very encouraging and supportive of me as an athlete. My running goals line up perfectly with our company’s core values. My husband and my son both participate in a lot of my training and my races, as support crew and as hiking partners, and they are always in my corner. Sometimes I don’t get all the sleep I’d like to have because there just aren’t enough hours in the day. When you are training for races, what does a typical week look like? It depends on the race, but typically for an ultra race like WS I’ll do two long runs back-to-back. Then I’ll have one day of either fast or uphill short intervals and maybe one other day of longer tempo on either road or trail. The rest of the time, I’m just trying to pile up time spent on my feet on beautiful hilly trails. What are your racing plans for 2016? First half of the year: Olympic Trials Marathon, Lake Sonoma 50 and then Western States. I’m still working on the second half of the year, but I’m planning to do the Transrockies run again, and possibly another of the Ultra World Tour race, maybe Mt. Fuji. I won’t do as many races, and I will focus on improving on 2015. I would like to race faster. What sort of questions do you get from road marathoners now that you’ve crossed over to ultras? Most common question I get is: Do you really run continuously for 100 miles or do you get to take a nap somewhere in the middle of the race? Often people believe that I train twice as much in terms of mileage when compared to marathon training, but that is actually not true. I spend as much time on my feet as I used to when preparing for major marathons, but I actually cover fewer miles. What advice do you have for others transitioning from successful marathoning to ultras? Start small, think big. Meet ultra runners and go running with them. You will fall in love with the community and the places they will take you running. Go watch the Western States finish line and you will want to run a 100-mile race. Dial-in your endurance nutrition plan. Check out some Hoka shoes, your body will thank you at mile 80 of a 100 mile race. Always toe the line of an ultra event with a healthy level of fear and respect. What are the biggest issues facing our sport? As ultra races get more popular, sponsors and prize money come along as well. There will always be cheaters, unfortunately, but I think we have to be proactive. We need testing at major events. We need random, out of competition testing. We need harsh penalties for those who do cheat. I’m in favor of lifetime bans, or at least lifetime earning bans for those who cheat. Once someone serves a suspension, I don’t care if they want to pay their entry fee and run an event for the love of the sport, but I don’t think they deserve to be able to make a living off of it. As an Olympian, do you think it would be good for ultras to become Olympic sports? Yes, absolutely! I’d love to see ultra trail running in the Olympics. I don’t know the exact process that the IOC uses to determine which sports to add, but given the rising global popularity of the sport, I think there are plenty of people and national governing bodies that would like to see it. If you could change one thing about ultrarunning, what would it be? I wish we had better ways to cover events for spectators, both on the course and at home. Live tracking is great, but doesn’t always work well in the remote areas that our events take place. It might be great if we could somehow use drones to film the top runners during races and webcast it, which would allow spectators to be right there too. That would be amazing. When you aren’t racing or training, what do you do for fun? One of the things I enjoy most in life is just spending quality time with my friends and family. My son and I can hang out with a book at a coffee shop for hours on end. I also love to hike and take pictures in beautiful places. Fortunately I don’t have to travel that far to find them. My favorite TV show is Shark Tank and my favorite book is The War of Art, by Steven Pressfield. On my i-pod: Led Zepplin, U2, Phil Collins, John Denver, Journey, Lenny Kravitz and some Adele. What secret would people be surprised to know about you?